Family Skiing is PROUD to offer you the Mont Cervin Palace Hotel DIRECT booking. When you book a room for 7 nights you get one full day of skiing for FREE with a professional BASI ski instructor who will take you to Italy, powder skiing, off–piste ... the choice is yours. Mont Cervin Palace is one of the best hotels, located in the heart of Zermatt. 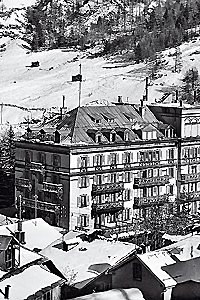 The Mont Cervin Palace Zermatt counts among to the most renowned holiday resorts for more than 150 years. Contemporary comfort combined with traditional values, personal care and attentive service distinguishes the hotel. SPA treatments and beneficial wellness days are also enjoyed under the ever–watchful eye of the majestic Matterhorn–and we are conscious of plenty more reasons why we cordially invite you to come along and share our beautiful surroundings and hotel. We extend you a very warm welcome to the Mont Cervin Palace already today! Price range: from 495,-CHF per room/night. Over the years the hotel has been renovated on a continual basis as well as equipped with the latest technology. The hotel has a total of 84 rooms with 146 beds, of which 26 are suites. Two thirds of all the rooms benefit from a view of the Matterhorn. A large pool with a waterfall, a generously-proportioned sauna landscape as well as various treatment areas and a private SPA for couples await you. In matters culinary, our guests are pampered by French-Italian cuisine in the cultivated ambience of the "Prato Borni" restaurant. And those seeking an additional gastronomic adventure will also find the very venue in the hotel's "Lusi" restaurant, which brings a touch of the Mediterranean to the mountain world with its lighter dishes. Price range: from 500,-CHF per room/night. ****S Hotel Schweizerhof is a sportive and easy-going hotel at the heart of Zermatt. 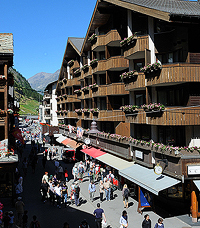 The Hotel Schweizerhof is located in a traffic-free zone on the Bahnhofstrasse at the heart of beautiful Zermatt. Guests from all over the world appreciate its buoyantly refined, rustic, easy-going and sportive atmosphere together with its warm-hearted and friendly team of staff! Naturally weary bones particularly appreciate sweet relief discovered in its pool and wellness area. The Hotel Schweizerhof has over 114 large and cosy rooms and suites, some with a balcony and stunning view of the Matterhorn. Price range: from 255,-CHF per room/night. The cosy chalet hotel with a breathtaking view over the roofs of the village to the King of the Alps: the MATTERHORN. With its spectacular tunnel entrance and elevator just five minutes walking distance to the village. Schonegg Granhotel offers Suits, Family, Double, Twin and Single rooms. Price range: from 145,-CHF per room/night. *** Hotel Hemizeus is situated in the south and quiet part of Zermatt, with a beautiful Matterhorn view. It consists of 42 comfortable rooms and family apartments. All the rooms are furnished with shower/toilet, telephone, cable-TV and radio. Most rooms have a kitchen corner and terrace or balcony with a Matterhorn view. Taste culinary creations from our kitchen team in the Hemizeus restaurant. We also invite you to nurse a glass of wine in our wine cellar or to enjoy a nice dinner under the old cellar vault. There is a space for 12 people. The ***Hotel Hemizeus offers a new Spa area with 3 saunas, Jucuzzi, Massage, Beauty, relax room with beautiful view to the famous Matterhorn. In summer you can relax on the canvas chairs in our garden. Price range: from 120,-CHF per room/night. The Rhodania hotel is situated right in the centre of Zermatt just 5 minutes from Sunnega and Gornergratbahn. 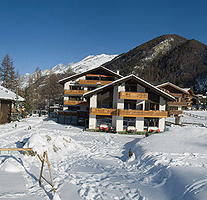 Rhodania offers accommodation in double rooms with and without facing Matterhorn. 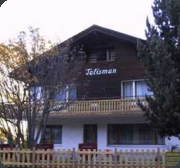 Price range: from 66,-CHF per person/night. A single free-standing house in Winkelmatten about 100 m from the bus stop and our Aparthotel Hemizeus. It has 3 floors: living room with dining area, fire place, radio, sat-TV, fax, kitchen with dishwashing machine, bath/WC/steam-shower, second floor with 4 double rooms, 2 bath rooms, one with whirlpool and 3rd floor is one large room consisting of a separate room with a queen size bed and another room with a living area and a queen size bed. All this of course overlooking the fascinating Matterhorn. Free using of sauna and steambath at the aparthotel Hemizeus. (100 m.) Daily hotel service (cleaning of the beds and the bathrooms, exclusive kitchen) included. Oxalis apartment is situated in Zermatt and consists of 1 double bed, tv, 1 room with a double bed and a single bed,1 kitchen with oven..., 1 bathroom with bath. The apartment is on the basement "north".